Base with round table of highly stable, die-cast alu, with CNC milled fittings and slides. Table size 230 x 230mm. Consult the table for cutting capacities. 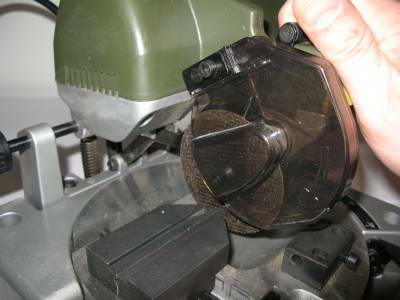 Well it all started good enough, but the saw didn’t actually finish a cut before there was a pop (belt slipping off somewhere) and then the motor just spun without the blade turning – I will let you know what the outcome is when I return it. No luck here as it failed very early on and I didn’t get very far…. It did not feel as stable and solid as maybe it should and there was some chattering of the parts when starting to cut. I’ve had one of these for 10 years and its never let me down. What were you attempting to cut? It doesn’t like steel, the closest it can get is 8mm threaded rod. Struggles with K&S angle, does alright on the round things if you go very solid but i found U shape or Square or Angle gets caught by the blade and bends it. I’ve spent most of my time cutting aluminium with it, for that it excels, that and wood its fantastic at. Been cutting 1 inch copper pipe all day with it, you have to be very slow and gentle on it though otherwise the blade catches. 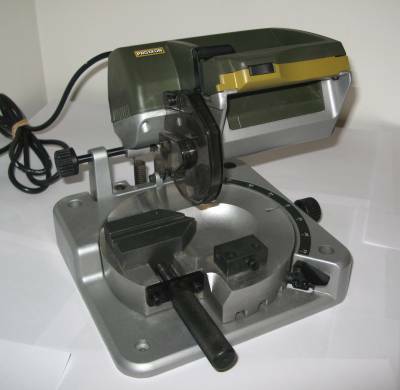 I’d borrowed this to try it and literally just switched it on to try and cut a piece of aluminium angle (quite small and thin gauge) and it stopped as soon as I touched the blade onto the workpiece – I imagine it was an old drive belt that had not been switched on for ages or it had had a hard time.